In the summer of 1620, Champlain returned to New France aboard the Saint-Étienne, accompanied for the first time by his wife and household, and in possession of great authority and support from the French Crown. On his arrival at Quebec, Champlain set about ensuring the loyalty of the colonists through a series of services and ceremonies intended to reinforce the power and authority in New France of the French Crown and Christianity. He also undertook a thorough inspection of the colony and was disappointed at the dismal physical state of the built holdings of Quebec and worried by its vulnerability to attack. He ordered labourers in the colony to commence work on a new fortification – Fort St. Louis, to repair the storehouse, and to erect a new habitation for his wife and household. Champlain actively pursued the development of agriculture in the colony and identified possible sites for farming at Île d’Orléans and Cap Tourmente. He also encouraged agricultural practices among both colonists and his Montagnais (Innu) allies. During this period, Champlain faced the ongoing challenge of keeping peace in the colony amid religious, cultural, economic and political disputes. In 1621, he instituted a set of laws for New France, which scholars suggest were largely of his own devising. Those in favour of free trade and open markets, however, resisted his authority in the colony and continued to cause him problems. Champlain worked to establish more agreeable trade relations with the Montagnais (Innu) and to promote peace with the Iroquois (Haudenosaunee) nations, in part by sending more young European men to live in Aboriginal communities to develop a better understanding of their languages and cultures. 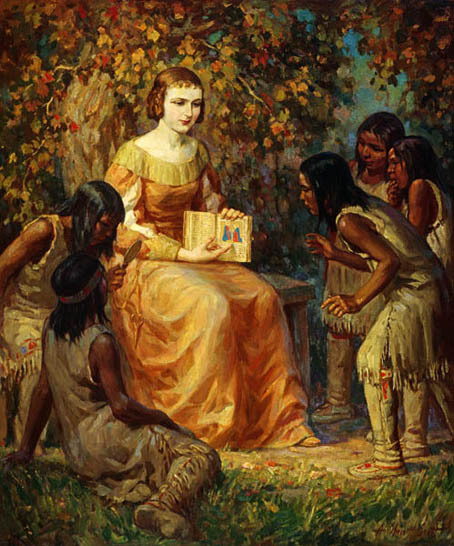 Champlain’s wife, Hélène also left a lasting impression on the settlement and its Aboriginal neighbours. Through her study of Algonquin languages, she was able to communicate with members of surrounding communities. But by 1624, after four years at Quebec, Hélène was ready to return to France. Before departing with his household, Champlain oversaw the beginning of construction on a new habitation at Quebec, but by the beginning of October, he and Hélène were back in France and soon established in a new residence in Paris. She never accompanied him to New France again. In the ensuing years, she did assist Champlain in his affairs but devoted an increasing amount of time to her religious interests. In 1645, she entered a convent and later founded a monastery in the town of Meaux. She died on December 20, 1654. When he returned to France in 1624, Champlain participated in successful meetings with the king and the viceroy of New France, both of whom supported his efforts to establish peace, order and religious tolerance in New France but did not always agree with his methods or overall vision. In 1625, the Duc de Montmorency sold his office of viceroy of New France to his nephew, Henri de Lévis, Duc de Ventadour, a devout Catholic, who recognized Champlain as chief lieutenant in New France and bestowed on him even greater power and authority in the colony. Champlain remained in France until 1626 and worked closely with the new viceroy to address matters of trade and colonization. Word of diminishing conditions in New France and increasingly strained relations between the French and their Aboriginal neighbours reached the viceroy in 1625. That the fledgling colony required attention became evident. In the spring of 1626, Champlain travelled once again to New France and resumed his residence at Quebec. Arriving there, he was greeted with very few signs of progress in the settlement. He immediately enlisted labourers to recommence work on the habitation and make improvements to the fortifications. He then chose a site for settlement at Cap Tourmente and arranged for a farm to be built there. During this period, Champlain also continued his task of keeping the peace within the colony and pursuing positive relations with his Aboriginal allies. In the winter of 1627-28, the Montagnais (Innu) presented Champlain with three young girls who were to live with the French to be trained in their religion, language and culture. This gesture appears to have improved relations between the two nations for the time being. Meanwhile, much activity – with great implications for the future of the colony – was taking place in France. From 1620 to 1625, the Montmorency Company, or the Compagnie de Caën, enjoyed a monopoly of the fur trade in New France in return for its sometimes reluctant support of religious and colonial activities within the territory. In 1626, the company reformed under the authority of the new viceroy, Ventadour, but by 1627 he was replaced by Cardinal Richelieu, a growing force at the French court. Richelieu created a new trading company known most commonly as the Company of the Hundred Associates. Taken together, these changes in France and Champlain’s actions at Quebec ensured the continued viability of the colony. The next threat to its survival, however, would not be as easily resolved.